I got a recent email from Trey asking a lot of good questions about my experience in Chile. Hey Pepe, I read the site and I wanted to write and ask some questions to you since you have been to Chile, as I have wanted to visit there. Did you feel safe traveling there? For the most part yes I did. There were some parts of Santiago that I wouldn’t want to visit by myself but those aren’t where you’d want to go as a tourist anyway! 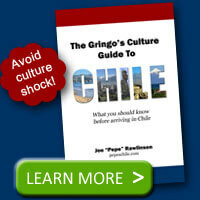 How were you treated by the Chileans when they knew you were American? Overall: very well. Kids would try out their English on me that they had learned in school or from movies. Some people who didn’t like the USA would vent that frustration on me but that was usually the rare case. Could you give me some details on how your experience was overall and anything you liked/disliked. 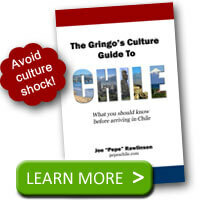 This site is a big collection of my thoughts and views of my time in Chile. But to sum it up, I loved Chile and the time I spent there. The people are great and the country has some spectacular natural beauty. A true gem. What were your favorite cities you visited? I enjoyed visiting the coast and Viña del Mar. Down south, I thought Frutillar, Valdivia, and Chiloe were beautiful visits. I have a great memory of sitting on a bench by the river in Valdivia eating lunch a just relaxing. Whenever I’m stressed out at work, I’ll envision that time! How was the Spanish they speak, I’ve heard its very different (I’ve taken some college Spanish). I’ve talked a lot about this on my Chilean Spanish and slang pages. The summary would be that Chileans have their own accents and slang just like any other Latin American country. Your college Spanish will help you speak and at least communicate the basics. Understanding older people and kids may be a challenge. yeah how was it chllin in chile and travelin their sites also how is the christmas holiday. Christmas was a very fun time of year. I’ve written an article on a Chilean Christmas that will give you more information.